It was theoretically a superstar collaboration in an era before such things happened all the time. 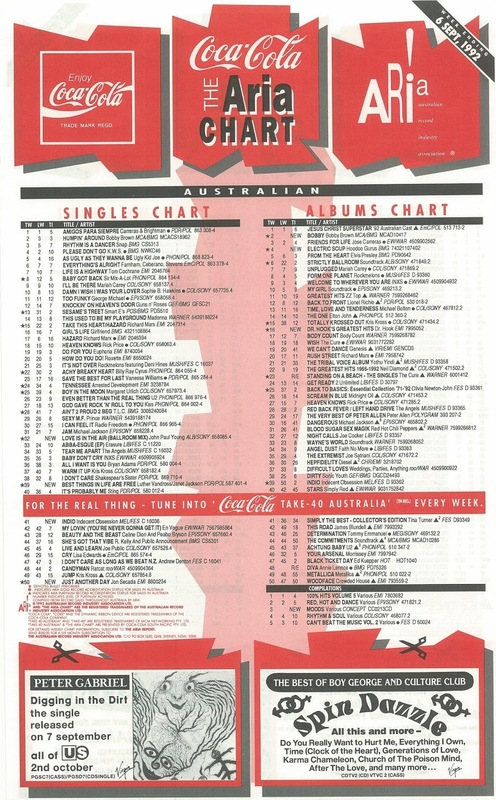 But in Australia, the two main singers on the most successful new entry from this week in 1992 weren't quite at superstar level. One performer had two top 10 hits to her credit - nothing like the string of 12 in the US - while the other had never troubled the top 100 before. As for the two featured acts on the song, neither had entered the top 50, at least not in their current guise. Still, the combined might of all the artists on one of the year's catchiest tracks almost went all the way to number 1. Another duet by two performers with little previous chart action continued to dominate the number 1 spot this week in 1992. "Amigos Para Siempre (Friends For Life)" stayed on top for a fourth week. This re-release of Enya's debut single from 1987 coincided with the repromotion of her first self-titled album as The Celts (although it didn't chart with that new title in Australia until 1995). "Small" was right, "victory" not so much, with this second single from Angel Dust (and follow-up to "Midlife Crisis") only making a minor impression on the top 100. With Mӧtley Crüe having summed things up with Decade Of Decadence 81-91, it was the perfect time for singer Vince Neil to embark on a solo career. The fact he'd either been fired from or quit the band kind of forced his hand, of course. Previous single "Feel So Real" was one of my favourite songs of 1992, and this follow-up was another rave/piano house classic with a huge wailing vocal from Debbie Sharp. Their previous collaboration "Forbidden Colours" had been a top 30 hit in 1983, but this musical reunion between the former Japan vocalist and the Japanese composer wasn't as successful. From their controversial (for the song "Cop Killer") self-titled debut album, this was the first of three top 100 entries for the heavy metal band fronted by rapper Ice-T.
Expectations were high for the the Newcastle rock band's second album, but this lead single didn't get things off to a great start. It'd take Tear Of Thought (which came out in October) until 1994 to reach its full potential. He'd tried to launch his solo career with three previous singles, but this time around, Jon (formerly Juan) Secada had the additional selling point of having been one of Gloria Estefan's backing singers and the co-writer of her US number 1 single "Coming Out Of The Dark". Gloria returned the favour, popping up on backing vocals and appearing the video for the lead single from Jon's self-titled album. Easily Jon's biggest hit in Australia, he'd make a couple more minor top 50 appearances over the next couple of years. This title track from Indecent Obsession's second album was the end of the road as far as the band's chart success went in Australia. It was a shame, because despite it not being obvious just what "Indio" was about, the song was another slightly more mature pop/rock track that showed the band could've grown with their fans and left their teen pop roots behind. On the upside, Indecent Obsession were gaining quite a following in different parts of the world - South Africa and Asia, in particular - a fact the band was able to take advantage of with new lead singer Richard Hennassey in the years to come. In the US, the pairing of soul star Luther Vandross, who'd really begun to hit his mainstream stride in the past couple of years, and unstoppable hit machine Janet Jackson was a big deal. The combination of two reliable hit-makers on a song that also featured Bell Biv DeVoe and fellow New Edition-er Ralph Tresvant, who'd both enjoyed a number of recent big singles in America, was a major music event. In Australia, only Janet was a big name, with her best chart showing being her two number 6 hits, "What Have You Done For Me Lately" and "Black Cat". 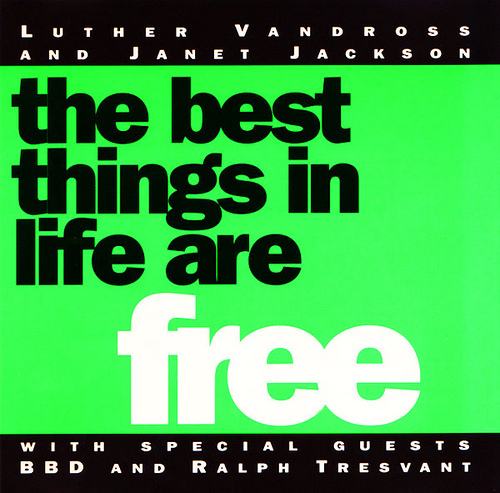 Nevertheless, we couldn't get enough of "The Best Things In Life Are Free", the hit featuring all four which was taken from the film Mo' Money. The lead single from the soundtrack masterminded by Janet's producers, Jimmy Jam & Terry Lewis, spent five weeks at number 2, stuck behind Billy Ray Cyrus. Despite the artists not being massive stars (or appearing in the music video) and the film not being a box office success locally, the joyous pop of "The Best Things In Life Are Free" was enough to ensure its popularity - especially since Australia went with the far superior David Morales remix over the original US mix as the main single version. Janet, of course, would go on to have many more hits - and even beat the number 2 peak of this song, while Luther would return to the runners-up spot with another superstar duet in a couple of years' time. In 1978, it'd been one of John Paul Young's biggest hits when it reached number 3, as well as making the UK and the US top 10s. Fourteen years later, a revamped version of "Love Is In The Air", which featured additional production by David Hirschfelder, featured prominently in Baz Luhrmann's directorial debut, Strictly Ballroom. Re-released to promote the movie and soundtrack, the song returned to the number 3 spot, providing JPY with one final chart hit - his first since 1983's "Soldier Of Fortune". A remixed version of another of his '70s hits, "Standing In The Rain", which also appeared on the soundtrack, was not as successful, missing the top 100 later in the year. Next week: a new band featuring two of Australia's most popular male solo artists, plus the debut of the song that'd go on to win the 1993 ARIA Award for Single Of The Year. I think "A Small Victory" is the best track on Faith No More's Angel Dust album. I wasn't aware it even charted, but it was never going to get higher than "Midlife Crisis". I remember thinking what a cop-out it was for Janet Jackson not to appear in the "Best Things in Life…" video. Like, that sort of behaviour is so George Michael, man. But then I was a big fan of the music video as an art form, and to my teenage mind, any artist who refused to appear in one, for whatever reason, was a bit of a tool. I assume Janet's non-appearance in 'The Best Things...' was because it was released through A&M - the company she ditched for a then-record sum contract with Virgin around this time. That doesn't explain Luther's non-appearance, though. Oh really, that probably sounds like it was the reason. At the time I thought the guy in the video *was* Luther (maybe because I knew what Janet looked like, but not him). Don't think I've heard this Enya track before. Enya setting a car alight via a lighting bolt coming from her finger (after the 3:30 mark) wasn't something I expected to see in one of her videos. I think I heard the Vince Neil track once on the radio. I'm surprised 'Take Me' did as well as #62 locally. Cool song, but I don't think I knew it back then. I wouldn't have known 'Heartbeat' if not receiving the parent album as a gift from my aunt - who heard the song in a store, liked it, bought the album, but thought it was rubbish, so gave it to me... Except it had a completely different (and better, IMO) version of the title track on it, with a female vocal and sounding more like Deee-Lite than this dreary ballad version. Unless there were multiple versions of 'Heartbeat' on the album, which there could well have been (I didn't properly listen to the rest). There was a guy in my form at high school, think "pretty fly for a white guy", who was into Body Count, but nobody else (including me) had heard any of their stuff. I first heard 'Just Another Day' through American Top 40, and it grew on me before finally hitting the chart here. I saw a clip of him singing live in 2010-11 on YouTube, and he seems to have lost the ability to sing, oddly, considering it sounds like he has a decent voice on this. There was also a second video - https://www.youtube.com/watch?v=-7N0B0IVibY - though I'm not sure which came first. Indecent Obsession suffered a similar fate to a-ha locally - not taken seriously as musicians due to appealing to/being marketed at teen/tween girls. I thought 'Indio' was probably their best single yet, but it didn't matter how good the music was - they were largely thought of as a joke. I liked 'The Best Things...' but it gets a bit too repetitive towards the end. Unless I'm not remembering the song correctly, it sounds like the audio on the video you've embedded has been pitched upwards (to avoid copyright detection?). 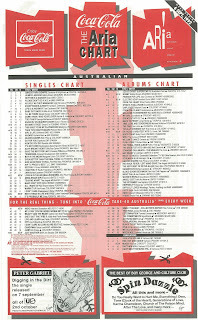 It annoyed me how the full song title wouldn't fit onto the new ARIA chart design. I thought John Paul Young looked about 60 when this version of 'Love Is In the Air' was out. You clearly didn't go to clubs back then, or I'm more ancient. I was 18 and you couldn't go into a club without hearing "Take Me", it was huge. A total classic. I was a mere 13-14 in '92. Sadly you would have missed the best years of club hits then, with the whole explosion of the genre happening here in the first half of the 90s. Unfortunately that all seemed to give way to boy bands and all that sanitized R&B/hip hip schlock that came in the late 90s and early 00s.